Caption slip reads: "Photographer: Hecht. Date: 1958-01-07. Reporter: Benson. Assignment: Serino Inquest. 58: L-R: Police Sgt. R.W. Idorf and Marie Therese Richaurd. 59-86: Marie Therese Richaurd (victim's gal friend). 161: Police officer Robert O. Potter (who shot victim). 87: Police officer E.F. Neville (who shot at victim). 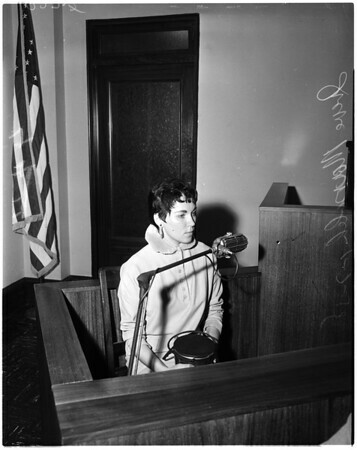 44-45: Irene Marsolek (passenger in victim's car)."